As the publisher of a major metropolitan newspaper, the Daily Bugle, Jameson's primary concern is to sell papers, and photographs of Spider-Man usually do the trick. Too bad he doesn't see Spidey for the hero he is! It's a little bit weird that Jonah is included in this series, based (as it is) on "The Death of Jean DeWolff" - yes, he's in the story, but it's (eventually) a pretty important plot point that he's out of town. 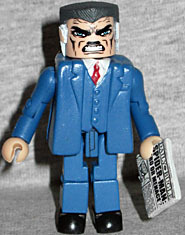 Eh, doesn't matter, this is our first real J. Jonah Jameson Minimate, with the only other choice being the Series 7 Chameleon variant. Straight from the box, JJJ is in his shirtsleeves. He's wearing the same vest as the Mayor, and has the Spirit's necktie. Here's a cool little detail: the front of the vest is blue, while the back is black, as though it were made from two different fabrics. 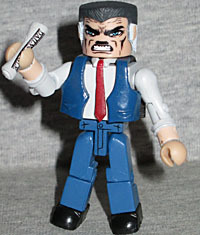 If you want him to have a more professional look, the set includes a suit jacket chest cap and matching blue arms. The coolest part, though, is that he includes two copies of the Daily Bugle: one rolled up, and the other merely folded over. 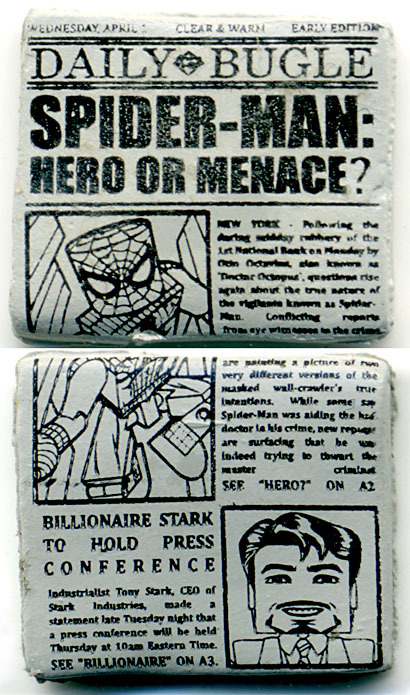 The folded ones has headlines about Spider-Man and Tony Stark (as well as tiny, tiny text in the stories). Thought up by WWII veteran Nick Fury, this United Nations-backed organization (the Supreme Headquarters International Espionage Law-Enforcement Division) reacts to threats around the world in their flying helicarrier. 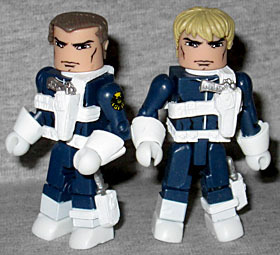 Yes, the Ultimate SHIELD Agents were nice, with their generic soldier uniforms, but this is the classic! A navy blue jumpsuit with bright white accents! It's got flared gloves and a utility belt that we've seen before, but the piece over the chest, with the holster and all the pockets, is new. The SHIELD Agent comes with a silver pistol and a knife that fits in the sheath on his boot. So you can create different looks, there are two hair pieces: a brown crew-cut and a shaggier blonde mop (which we like to pretend makes this a Minimate Clay Quartermain). Of course, you know what it means when one figure in a package is an army-builder with two different looks: there's a variant! 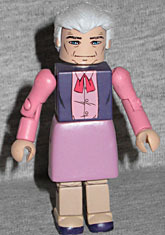 So for this set, J. Jonah Jameson has been replaced by Aunt May - talk about opposite ends of the emotional support spectrum! We've had a movie-based Aunt May, but not one from the comics. She gets a new hair piece, with the typical comicbookish bun in her hair, and has a purple vest over a pink dress. Her legs are slightly darker than her hands and face, suggesting hose, and her shoes match her top. Although Aunt May isn't a huge part of the Jean DeWolff Saga, it doesn't matter: getting a toy of Peter's aunt is just too cool! In fact, even if you don't care about Jean DeWolff at all, both versions of this set are aces! Jonah, Aunt May, a couple of SHIELD Agents... good stuff!